Hot on the heels of NASA’s recent announcement that October of 2014 was tied for hottest on record in its global climate measure, NOAA today also made a two record-breaking announcements. First, according to NOAA’s measure, global surface temperatures were 0.74 degrees Celsius above average for October. This makes the month the hottest in NOAA’s measure since record keeping began. Second, as of the middle of October, global temperature averages for the year had edged out all the previous hottest years on record. 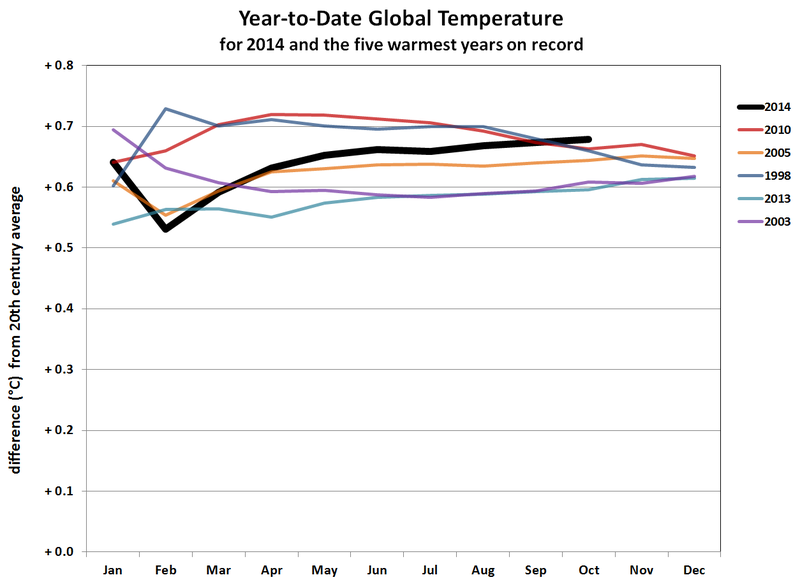 This makes 2014 the hottest year on record so far with just two months left to go. The second announcement is a critical one. Crucial because it again brings light to the fact that the so-called global warming pause is little more an artifact of cherry picking and over-playing to the influences of decadal natural variability than it is any measure of challenge to an observed 136 year warming 15-20 times more rapid than the warm-up at the end of the last ice age. Cause for serious concern as this year’s new and increasingly strong challenge to the 2010 record high is coming during a time in which El Nino has not yet developed. For reference, almost all recent record warm years occurred during the massive ocean-to-atmosphere heat transfer event that is El Nino. Still not so for 2014. Perhaps even more importantly, the cherry of all cherries — the monster El Nino year of 1998 — is gradually getting edged out by ever wider high temperature margins. NOAA forecast models show that it would take a rather substantial cool-down during November and December to keep 2014 off the record books. Any average at or above 0.65 C higher than the 20th Century would place 2014 as the new record holder. Temps at or near current measures showing 0.70 C or higher readings would cement a relatively significant departure of +0.03 to +0.04 C above 2010 and 0.05 to 0.06 C above 1998. Such an event would be exceptionally significant when one considers that ENSO status has remained just to the warm side of neutral for most of the year. All the NOAA forecasts show us staying in El Nino territory through the year and at least into the beginning of next. Shouldn’t that mean that there’s really essentially no chance of this _not_ becoming the new hottest year on record? Thanks Robert. And this year (so far) brings this new-ish decade up to the warmest since 1900, with only the ’40’s decade cooler than the previous. According to GISS data. If we have these temps without El Nino, it becomes a rather high challenge to stop warming under the current human forcing even for a decade in which PDO is negative for the most part. Is there a doubt in anyone’s mind that as soon as the anomalous year of 1998 is swallowed up by the next uptick in warming (possibly in progress as we speak) that the confusionists/denialists will simply pivot to ,”well, it’s really not that much warming and it’s really not that big of a deal”? It’s downplay and deny all the way from here on out til doomsday. Sad to say, the Australian Liberal Party Government is the global leader in downplay and deny! Our Foreign Minister has just basically told the US Pres off (in writing mind you) for even suggesting the great barrier reef might be under threat! Not forgetting Tony Abbott’s deep love of coal… it built this great civilisation (i.e. British Empire) ya know! Deniers love to talk about the lack of “statistically significant” warming over the last 15 or so years without knowing what this means, namely a trend large enough to rule out an absence of warming. In his blog the very fine mathematician, Nick Stokes, makes the telling point that while recent warming trends of around 0.9 degrees per century might not be (quite) significantly different from zero they are also not significantly different from 1.8 degrees per century, a trend in accord with model predictions. Funny how deniers, for all their claims that climate scientists are not recognising the uncertainty in their subject, actually ignore half of the probability distribution for the uncertainty. See NIck’s remarks in the comments section of http://moyhu.blogspot.co.uk/2014/11/lingering-pause.html#more. Rate of warming at the end of the last ice age was 0.005 C per decade. Statistically significant enough to melt mountains of ice, in other words. Please tell me what I’m not seeing here. thx. Oh, wait. These are graphs of how the yearly average was changing as the months went by, not monthly averages. Posting this comment anyway in case anyone else was similarly confused. Meip, best comment of the day! I love the honesty. Thank you bassman, honesty is the only way out of this mess. I did the same mistake, its an unusual graph, as we are used to points being under each month mean a value for that month and not a moving average that also accounts in all previous points for the same year. A telling hint is the large variation in the start of a year and then a more stable line as each month averages over more data. Miep I made a similar misinterpretation to my embarrassment to a NCDC scientist. Still try not to remember my blush! Part of the learning curve! 🙂 Kevin. We’re so used to seeing monthly graphs that are about what is happening during the actual months. 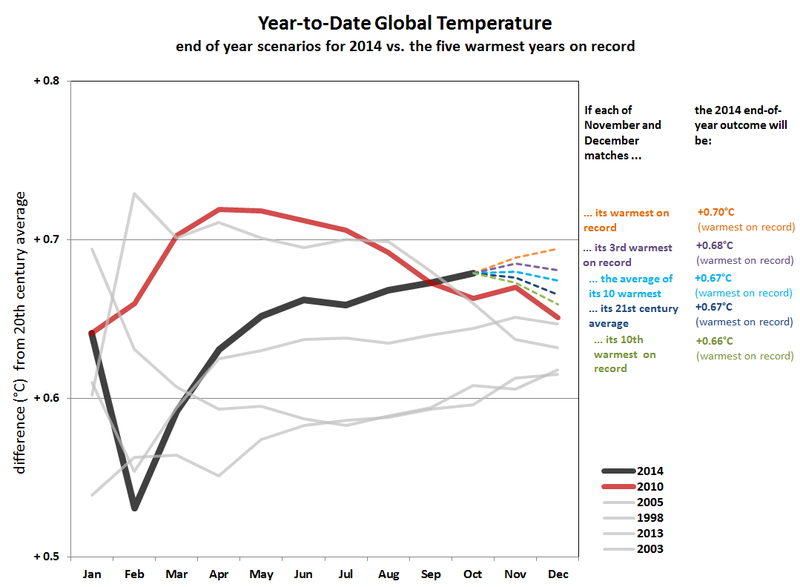 “Year-to-date global temperature” sailed right over my preconceived expectations. I started writing my comment and then read this post yet again, because Robert couldn’t possibly mess up that badly unless he was losing his mind, and other commenters got it. Good lesson there. Yep, it’s the cumulative average with the first month averaged with those that follow going forward. Interesting to see that this year warmth has been more resilient as we approach year end. In the past, this kind of trend has been somewhat more prevalent in pre El Nino years. Robert: it seems to me that the relationship between the ocean and weather patterns is changing, so I am wondering what official El Niño events will mean as we move along further into weather weirding. All that heat buildup and still no official El Niño. The jet disruption is helping to drive the stalled blocking front west of North America, but now we’re getting weather slipping past those boundaries. Second year in a row we got ten or more inches of rain, a year’s average here in SE New Mexico, in less than a week in September. The monsoonal flow was further north and rather stronger than usual. In any case, the block hasn’t been perfect or impermeable, or not subject to weather moving around it. It has simply been persistent enough to cause extraordinary drought in California over the past few years. El Niño would tend to challenge the block. We have warm-neutral conditions that now challenge it somewhat, but the meridional flow keeps wanting to RE-establish and RE-build the block. A part of this is probably due to extra Arctic heat continuing to drive a weakness in the Jet in that latitudinal zone. Ocean surface temperatures were extraordinarily warm this year — primarily due to North Pacific, North Atlantic, and Arctic Ocean temp increases. Some Equatorial a Pacific warming also drove added heat, but it was not the source of the most heat, and was a contributor but not the only driver. I don’t think we can say the overall Niño pattern has changed given what we’ve seen thus far. I made some speculation to that point earlier this year, but there’s not enough support for it to call it anything other than that. If we look at paleoclimate, we had periods of permanent El Niño when the Earth was cooling down tens of millions of years ago. So it does seem that temperature change can have an extraordinary impact on this natural variability driver, which may be worth keeping in mind. Robert: Thanks for the El Niño clarification, that is helpful discussion. That said, it does appear that the human forcing is enough to bend the warming curve increasingly beyond the base influence of established natural variability drivers like El Niño. So regardless of whether warming is changing El Niño, it appears that El Niño may well be less of a requirement for new global high temperature records. A statement that has quite a bit more in the way of support. In any case RE Buffalo, looks like a warm snap to 50 to 60 F and 1-2 inches of rainfall could rapidly melt the snow and cause rather serious flooding this weekend. So the weather madness for that region isn’t over by a long shot. If there is a building El Niño, we end up with a collision of sorts between the strengthening storm track and a meridional flow that appears rather reluctant to loosen its grip. There’s a rather high potential for strong storms and powerful weather swings in such a situation. El Niño events aren’t requirements for temperature records. They are heat driven events, not inherently heat-generating events. They are the engines, not the fuel. Preaching to the choir I know. This winter will bring some unpleasant surprises. Another great post Robert, it sure is good to see you back. The warming continues, unfortunately not so much here in the eastern half of the USA, and that is leading to more garbage discussions. I have been distressed lately with the current trend of even good meteorologists getting sucked into a debate about whether or not a particular weather event is a result of global warming. Of course it remains impossible to pin causation of a single event to a rise in temperature, but the bigger picture of our changing the entire background state of the atmosphere is getting completely lost in the discussion. As soon as a reputable voice says “well, we can’t say with any certainty if this…” the point becomes lost. People now are expecting to see climate change like a package in the mail. It really is ridiculous. On the other hand, it is very refreshing to come here and read the comments of those who do in fact, understand what is happening. Griffin: Yes, it’s maddening. A basic understanding of physics should lead to obvious conclusions regarding all this ice melt and what it drives. But far too many are still even denying the ice is really melting at such a dramatic pace, let alone trying to understand how that affects the oceans and weather. Weather moves around but ice is more local, melt ice locally you get more local cold, but whatever is melting the ice is a heat engine that is acting in a much more general way. Heat goes into warming water, air, and melting ice. The responses to heating are uneven and result in radical changes to weather in local environments. As transition ramps up, the extremes of weather expand. And though there is net warming overall, it doesn’t mean that some places don’t experience extraordinary winter type weather. We are probably going to set off Heinrich type events in the Northern and, later, Southern Hemisphere. The localized cooling in the context of overall global warming, especially in regions bordering Greenland and the North Atlantic could be sporadically extraordinary as glacial melt ramps up and the Arctic Ocean warms. We’re seeing the start of that now. In the end, it’s not the start of a new ice age as some climate change deniers would have you believe. It’s the beginning of the death throes of winter. We have both the rapidly warming Arctic and an inexorable trend of rising global temperatures as proof enough of that. Robert: Yep. And as Colorado Bob likes to point out, extremes get more and more dramatic until a new equilibrium is reached. A major driver of those extremes is the process of ice sheet softening and destabilization which can set off some rather radical climate swings. Steroids remain a useful analogy. You can’t prove any individual home run was caused by steroids, and athletes even still struck out when using them, but only a moron would contend they didn’t influence home run totals while they were in widespread use. Thanks for reposting this. Fantastic analogy. It’s a silly way to discuss climate change, really. Sometimes it just makes me think people are trying to be a bit cute about a serious issue. Talking about it this way seems to imply that climate change has little to no impact on weather, which couldn’t be further from the truth. Saw a nice comment on Twitter the other day “It’s cold so global warming is a con. And in other news I just ate so world hunger is a myth!”. And the coldest year? That’ll be 1909. And the difference between the coldest year and the hottest year? Good for the wonk blog. And, yes, we’re almost certainly feeling the start of things to come. I love how the comments are chock full of people who are determined to pull any one sentence sound bite over simplification that they heard from “Rush” as evidence. It is like arguing with someone over cutting edge 19th century science and they … just … don’t … get … it…. I don’t bother interacting or trying to educate them, as it is akin to trying to teach a dog quantum physics. Try as hard as you may, and no matter how determined you are, the dog tilts it’s head to side with that “dog magic” look and … just …. doesn’t … get …. it …. Hmmm….. maybe it is possible to get them to understand after all! Quite a bit coming in this week. WASHINGTON, Nov. 20, 2014 – Climate change could make both government and private sector players in the crop insurance program more vulnerable to potential losses, a report released today by the Government Accountability Office (GAO) said. The report, which discussed flood and crop insurance, said “exposure growth in hazard-prone areas has increased losses” and went on to say climate change may only make the problem worse. Between 2007-2013, the report said data from the Risk Management Agency (RMA) and the Federal Emergency Management Agency (FEMA) showed an increase of 8 percent in exposure to potential losses for insured property, an increase of about $100 million. The impact was felt to a greater degree in the private sector, where losses took a 10 percent jump, totaling about $5.8 trillion from 2007-2012. I think it’s pretty clear that future losses aren’t the only issue. We have increasing losses now. Some of that is due to increased exposure. But we’ve had a number of climate events that have severely impacted agriculture. Here in the US, we’ve had a long running string of extraordinary droughts and floods since 2007. The Texas drought was followed by the massive 2012 drought covering much of the nation which was, in its turn, followed by the current California drought. In 2011 the Mississippi had one of its worst floods on record. In 2012 it dried up to the point that river traffic was constrained, then halted in fits and starts. The list of crop disrupting storms is almost beyond count. So we can’t say that we are now at some kind of normal base line weather/climate. The climate is pretty clearly wrenched out of its usual, steady, milder range. Yet we often talk as if things are somehow normal, like the weather extremes ongoing outside are some background cartoon that we can turn the volume down on and ignore. It would be helpful if the insurance folks would acknowledge that they’ve already seen increased damages due to climate related weather extremes. Instead, they appear to have bowed to the usual zombification. That’s a good reminder of was ‘is’. It’s easy to fall prey to fatigue when confronted with a plethora of mind-numbing messages. And especially as we reflexively cling to what we hope might be. We should observe reality as is. Not worst fears. Not to hopes that things were different or to memories of a normalized past overlaying the increasingly altered present. Absolute contempt for truth – perversion, peeyar, lawyering, & lying from Yahoo news. So very laughable. And so very sad that people will inevitably fall for what amounts to a disingenuous slight of hand. The informed reader should consider the source. And CATO has a long running record of misrepresenting scientists. CATO’s statement ‘100 percent of scientists agree that global warming has stopped or slowed down’ is false on its face. We have a majority of scientific bodies claiming that overall warming has accelerated, but that the extra heat has gone into the oceans and into glaciers, rather than going to work to warm the atmosphere. Even if we are to look at atmospheric warming, we have many scientists who have cautioned that rates of atmospheric increase will not follow a smooth track. So though the years since the super El Niño of 1998 have shown less warming in the atmosphere, this is primarily due to the influence of natural variability on the climate system. A majority of scientists point to the decadal measure as a far more accurate way to determine overall temperature trends. And in the decadal measure we see hottest decades followed by hottest decades. In general the statement is so parsed as to be blatantly dishonest. Do scientists agree that the world will keep warming and that the pace of warming will almost certainly speed up this century? Absolutely. Do scientists agree that we are dangerously close to crossing climate tipping points? According to IPCC, many now do. Do scientists point to the rapid accumulation of greenhouse gasses in the atmosphere as a threat that should be taken very seriously? Absolutely. So what does this CATO yarn mean in its substance? Did they interview scientists like Gavin Schmidt or Peter Wadhams? Did they ask Trenberth or Jennifer Francis? No. They, instead, like Wall Street bears watching the inexorable and extraordinary rise of a stock who parsed the data in order to point out one of the periods in which a brief correction was observed. Then they made an outrageous claim based on this narrow subset of data while failing to acknowledge the overall trend. In the cherry picking party that has become the Caller’s coverage of global warming, this is the cherry at the top of the heap. Disappointing in its small minded and obvious attempt at misrepresentation, but not unexpected. Yes, lies boldly retold often sound plausible. But maybe the truth is becoming so obvious that the only recourse by Cato-ites, etc is to throw up absolute junk. From my POV, CATO, with varying degrees of success, has been throwing up junk for years. In all honesty, this is one of their more subtle gestures. At least the cherry in this case is mostly real, if not blatantly lied about in the assessment. i’m seeing this crap all over the place now – even on sites that are otherwise pretty reliable and accurate! The ruse is getting thin & desperate, yet louder. The cherry picked data pile is so small now that they are reduced to conspiracy theories, misquotations and ad hominem attacks. Cutting out single sections of data.. The Caller is terrible. CATO might as well rename itself — COAL. NPR has gutted its staff dedicated to covering environmental and climate issues. Given the nation’s and world’s renewed focus on the threat posed by unrestricted carbon pollution, this baffling move is already receiving widespread criticism from scientists and media watchers. It is “a sad commentary on the current state of our media,” as one top climatologist told me. 50% of their income is from licensing content, the balance from corporations / foundations. They may be pressured by one or more of those to reduce that content, or it is simply a response to a populous that is more concerned about a kardashian bum picture, the “real houswives of stupidtown” and anything else that does not require any form of critical thinking. I once heard Greg Palast describe NPR as: National Petroleum Radio. NH hot oceans, cooler continents is an interesting mess. IIRC, one of the earliest-predicted consequences of an increasingly open Arctic Ocean was increased autumn snowfall in northern latitudes. It just makes sense. Basically, we have “Ocean Snow Effect” on top of the kinds of enhanced lake snow effects we’ve just seen in Buffalo and environs. EFFECT SNOW ENDS…A WARMING TREND WILL START EARLY THIS WEEKEND. DEW POINTS WILL MAKE FOR A MORE EFFICIENT MELTING OF THE SNOWPACK. POTENTIAL FOR FLOODING WILL RAPIDLY INCREASE. CAMBRIDGE, England, Nov. 19 (UPI) — The acidification of lakes in Canada in recent decades, caused mostly by industrial pollution, is pushing freshwater habitat into “an entirely new ecological state,” researchers say. 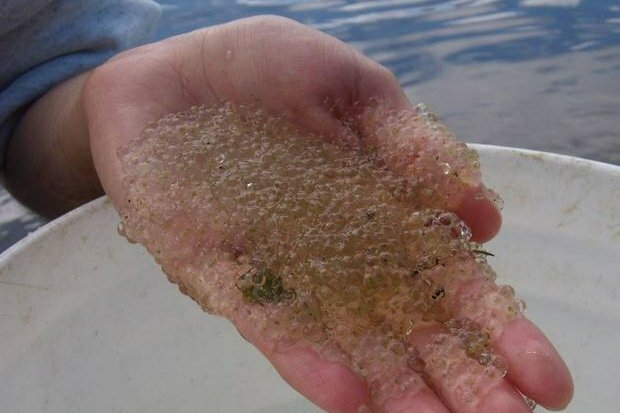 As acid levels increase and calcium levels drop, lakes are finding themselves playing host to a proliferation of small jelly-like invertebrates. The reduction of calcium in acidifying waters is good news for the jellies known as Holopedium, but it’s bad news for traditional plankton (like Daphnia water fleas) that serve as the foundation for freshwater ecosystems. Yes, what we used to think of as the purest water on Earth – from cold Canadian lakes. Very sad. The only plus side I see is that Molson and other Canadian Beer companies will no longer be able to tout ‘pure Canadian water’. It would be a mistake to think that more confirming data or extreme weather will turn the deniers. Their entire world view is under threat and their anxiety levels are increasing. For the true believer (white male conservative) this issue is their last stand. They have lost every major battle (hearts & minds) in the cultural wars in the last 50 years. They are like a cornered animal with big money manipulating and backing them up. It’s fight or flight time. These are dangerous people and they will not give up. It would be a mistake to view them as a bunch of denying morons who are wrong again. The PBS move is no surprise and I expect to see even more financial (advertising revenue) and political pressure applied to media outlets and personalities that threatens their position. The big money still has plenty of moves they can make and the true believers will be manipulated for maximum effect; they are just pawns to them. I have been a history buff for decades so the questions I keep asking myself is, to what lengths have rich powerful men gone to, to maintain their power and wealth? Are there any examples of these types of people stepping down for the greater good? Cincinnatus? George Washington? Propaganda. They never quit but are sometimes defeated. All these people are maniacal workaholics. Their true belief in their own gratification and empowerment drives it. And yes, they are merciless, unceasing, and will stop at nothing. That’s how they achieved success – ruthless pursuit of it. And that’s how they have been and will continue to fight this battle. Cheating and getting away with it, for them, is part of the game. So, yes, it’s very clearly not over. We are in a tough strait and the difference between success and failure balances on a knife edge. You may well be a student of history. I’ve been a student of the evil in the hearts of men for some time. The more I behold the awful symmetry of these hyper-predators, the more I come to believe that hard work in service to nothing other than personal advancement is the chief of all sins. Very profound statement Robert. Thanks. Ap, I’ve often made a similar argument in many fora. If climate extremes alone were enough to sway the public and politicians, places like OK, TX and Australia should have the most forward-looking politicians on fighting climate change. That doesn’t quite seem to be the case, right now. Coastal Oregon and coastal waters has wind warnings for 30-40 kts out of the south. Null School graphically shows a large counterclockwise rotation over the Aleutians — and a large clockwise rotation off of Southern California. The winds and gradient have the air slamming against the PNW coast and northing. It’s quite a show at this time. Don’t know how long it will last. Looks like quite a bit of subtropical air is being fed into coastal Alaska. Storm track across the Pacific is quite intense. That block is getting squashed but still keeps its claws in. Interesting weather/climate to say the least. Quite a bit of fetch, too. Winds traveling across 2,500 miles of ocean before slamming into the coast. Bomb low off Canada and Alaska and a huge front sweeping out. Gradient between high and low is quite impressive. It appears to be irrational, however, mounting crop yields really add more carbon dioxide to the environment. Over the recent decades, sustenance generation has expanded pointedly to meet demands for rising populace. As per the recent study directed by researchers at Boston University, expanding crop yields represents as much as 25% of the recurring boost in greenhouse gases. Plants soak up carbon dioxide in spring and summer alter solar energy into food, prompting an exceptional drop in barometric Co2. At the same time that consumed Co2 is discharged once again into the air in the fall and winter, said Chris Kucharik, co-creator of the study and a professor at the University of Wisconsin-Madison. The study is published in the Nature journal. Sao Paolo water supply is now at 9.7%, or at 1.0% into dead pool. Had they not added the dead pool to the reported volume on Oct 24th, their site would be reading -1.0% available. They have dropped ~4.0% in just under 4 weeks. At this burn rate, they will hit 0.0% of dead pool by Mid January unless they get mega rain fall. Of course, the point of zilch is somewhere above 0.0%, not sure where though. They have until basically Christmas / Year End at best (without significant rain fall). And they thought the global refugee crisis was already bad. We end up with no water for large portions of Sao Paulo, we either have climate refugees in place, or we have mass migration away from a failing city. It makes it that much harder when the evil is promoted by a criminal government and most of it’s citizens are minimizers, deniers and/or profiteers. If a once in a thousand year rain fall event happens over the tar sands it will be the biggest environmental disaster in history. Since these record breaking rain fall events are quickly becoming the norm what are the chances it may happen? That’s how civilizations fail. They become corrupt and decadent. Agree. No offense to anyone here who may be wealthy and have an active social conscience, but rich people are like the cholesterol of society. Sooner or later they succeed in taking over whatever political system there is, and at that point, any change that is not in their (narrowly defined) interests stops and the society begins to go downhill. MHO. I think that’s a pretty fair assessment. Unless there’s some kind of system that turns things over from time to time, it’s a society killer. Even harder when it’s your own family, yet they seem so decent. For example, I was born in Calgary and still have lots of family there. My cousins are directly involved in the oil business. One owns an oil exploration company and the other crunches data for some tar sands outfit. These are church going, law abiding tax payers with families. If you met them you would say they are “nice people”. Are they corrupt and decadent? Denial and minimizing are still a choice, so I guess so, but not in the Hollywood villain sense. Corruption and decadence, like most things in life, have different shades. I also think there are some things about humans that are very complicated. The wrong that is ignored and glossed over is the one that comes back to haunt us in the end. These people are decent folk, but part of a destructive system. Their livelihoods depend on that destruction, yet they are otherwise upstanding. They are captive to the externalized harm. I have friends and family who are similarly decent outside of their political beliefs and preferences. One is a VP at a major engineering firm. Some of their projects involve moving factories from high wage states to low wage states. As a conservative, he takes a bit of pleasure in doing this. Of course, it’s all Fox News and complete denial on climate change as well. But if you met him, you’d say he was a nice person. The things people do for their survival can often become quite twisted and convoluted, especially when that survival and success is dependent on harm somewhere else. People make the choice, whether consciously or not, to participate in that harm or to do something else with their lives. Many shrug and say it’s out of their control. Others, like those people you meet the beach who enjoy stomping on some poor kid’s sand castle, seem to take a maniacal or bully glee. Still others will attempt to compensate in other ways — donating to charity as a form of guilt-giving. Regardless of whether or not the person engaged in this activity is charming, or even otherwise morally upright, taking part in a system that leads to ongoing harm and loss of future prosperity and prospects is the very definition of decadence. Rome probably had many otherwise charming, likeable, and even individually moral persons serving it as it made decision after, decision that squandered resources and led to its downfall. Easter Islanders were probably dealing mostly with the best intentions as they kept cutting down trees for what an outsider would call decadent religious practices. The Vikings in Greenland had all sorts of cultural and seemingly rational excuses for not learning survival from the Inupiat tribes and engaging in constant and oppressive conflict with them, which ultimately led to their die-off. Sometimes or even often, it’s the most charming and likeable people who are involved in the bad decisions. But it doesn’t make the decisions or the activity any better. It’s just one of the ironies of destructive action — that it is often acceptable and even encouraged. Which is why the society fails in the end. “…taking part in a system that leads to ongoing harm and loss of future prosperity and prospects is the very definition of decadence.” Nicely put. But doesn’t that pretty well apply to all of us, to some degree? We can and should extricate ourselves from the most harmful aspects of the system as much as possible (minimize most meat eating, flying, etc. ), but ultimately we are essentially trapped in the system, aren’t we? Re being trapped in the system, I remember hearing in church, maybe 50 years ago, a story (possibly apocryphal) about an Englishman who was very disheartened by World War I and resolved to relocate somewhere where he would be safe from future conflicts. According to the story, he chose a remote Pacific island. Its name was Guadalcanal. I don’t think opting out, unfortunately, is really a serious option. Whatever you have to preserve yourself and family, others will want–and there will likely be hundreds or thousands of them. Just MHO. Yes. There’s this cynical view that we’re immune. Rude awakening time. Part of this view was perpetuated by the book Windfall. As you well know, Bob, no-one dodges this bullet. Europe’s olive harvest was hit hard this year by bad weather and blight, which will likely lead to consumers spending more for some olive oils, according to the Associated Press. The European olive oil crisis comes at a time when Europe’s southern economies are struggling to jump-start growth. In Italy, where national production of olive oil is expected to drop 35 percent, the bulk price for extra virgin olive oil has already jumped more than 3 euros – from 2.7 euros to 6 euros – compared to the same time last year. “This is the worst year in memory,” Pietro Sandali, head of the Italian olive growers’ consortium, told the AP. 12 deaths (so far) and major damage (more to come) from one snow storm everyone knew was coming in a region use to heavy snow. 12 seems high. Should be an interesting weekend in Buffalo. The reason for Europe’s particularly bad olive harvest was infestations of olive fly and olive moth brought on by high spring temperatures, abundant rain and a cool summer, the AP reported. There are olive trees in Italy that are 1,600 years old. I find it interesting that these crops that do not leap to mind, when we speak of how we will feed ourselves . Are in trouble today. Coca, coffee, olive oil. We could live without them, but god , what a boring world, when they are gone. I also find it interesting that the bugs got the upper hand over the olives this year. The bugs can change yearly, the olive trees just stand there. They are a proxy I never thought of. I buy tins of cocoa powder and put a bit in the chile with cinammon sticks. Faux molé. I run hot water through the coffee grounds 2-3 times. Olive oil I don’t know how to conserve so easily. It’s mostly half fake already anyway. It was probably a much more interesting world 200, 2000 years ago, but we’ve pretty much forgotten about that. No one will be bored by the lack of coffee, chocolate or olive oil, once those who remember them are gone. Which is horrible in its own right. As a system moves to the tipping point . it swings back and forth. It;s going to be 60 degrees in Buffalo with rain , I can’t ever remember this. And neither can anyone here. Colorado Bob: In February of 2011 temps ran between zero and 20°F here for about four days straight. It was worse further north. The compressors from the gas lines coming out of Texas failed because of electricity overages, and thus outages, because there were no backup generators. Widespread problems arrived. This took a good week to sort out. And we’re in the south. Probably not a good idea to rely on complicated remote infrastructure entirely. I watch that jet stream all the time. What will it bring us next? The dividing line between hot and cold is quite extreme… That’s becoming more prevalent. Though I express the need to try and meet, I also feel the impassible edge of a mirror-reality. And the nature of the beast is the Other. It may be called “evil” and treated to Inquisition. Who “owns rationality”? 1. Work to undermine or otherwise sabotage the most destructive parts of the existing system. 2. Work from within the system to try to change the most destructive parts and substitute less destructive options, but recognize real costs when doing this work. 3. Walk away from it as much as possible, consider it already dead and work to make a life that is as independent as possible from the destructiveness of the existing system. I do think people waste a lot of time trying to argue that any of these are invalid approaches. Here is what American politicians are spending their time and your money on. Keeping out the peasants. Moat creatures need to live too. This could be a good project for Monsanto, new and improved robust moat predators. Certainly not those whose ideology involves profit from harm and ignoring the plight and indeed the voices of the less powerful. Welcome to being a top climate thinker . Never stop . Cheers, Bob. Will keep doing my best! So this so-called pause/slowdown is really stronger trades pumping heat into the pacific. This will be driving the atmosphere further from equilibrium, pumping more heat into the system. I fear the next big el-nino event will be a serious wake up as we see sea surface temperature go through the roof.SSTs in the tropical pacific already can hit 32ºC, when this heat gets released, it will make 1997/1998 look like nothing! I wonder weather such an event will ‘flip’ us into a normal atmospheric circulation, or into a new, even more weird one. We’re in a period of atmosphere to ocean heat transfer, similar to the period from the 1950s to the mid 1970s. However, during that period, the human ghg heat forcing was not powerful enough to over-ride natural variability. So we had a very slight cool-down against the overall multi-decadal warming trend. This time, we have a similar atmosphere to ocean heat transfer. But the human forcing is now so strong that we still see overall atmospheric warming, regardless. If the oceanic highs continue to be pumped up by a thickening atmosphere and the trades continue to be stronger, then it may be an indication that the atmosphere to ocean heat switch is more permanently on. In such a case, natural variability is obliterated by the human heat forcing. The more likely case is that the Pacific eventually becomes so engorged with heat that it eventually lashes out against the massive highs and prevalent trades in the kinds of monster El Niños you’ve envisioned. In that case, we see a period of much more rapid atmospheric temperature spikes than we’ve seen since the cherry year of 1998.